PreMYo Rizal Judge & National Artist Rio Alma Launches "ANG ROMANSA NG PAGSAGIP NG OSONG MARSO"
UST Publishing House announces the launching of Ang Romansa ng Pagsagip ng Osong Marso/The Rescue of the March Bear: A Romance, first book of speculative poetry in Filipino by National Artist Virgilio S. Almario (aka Rio Alma) with an English translation by prizewinning poet Marne Kilates, on March 8, 2013, 5 pm, at Jorge B. Vargas Museum and Filipiniana Research Center, Roxas Avenue, University of the Philippines, Diliman, Quezon City. 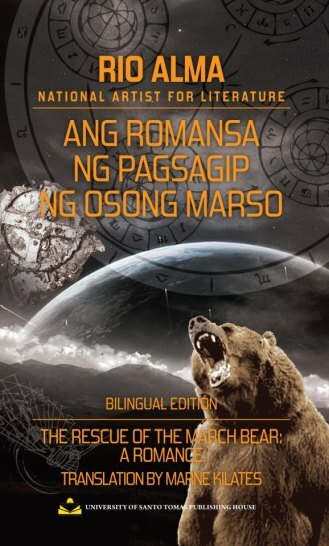 Ang Romansa ng Pagsagip ng Osong Marso/The Rescue of the March Bear: A Romance explores a universe with two suns and romanticizes the capture of a lowly creature from an obsolete world. The collection of poems, which follows the fate of the March Bear in a territory where no mountains, flowers, and plants ever existed, provokes reminiscences and musings of the past and the lost world. But with its memories rendered useless, will the March Bear have the chance to survive? Rio Alma has written more than 40 books of poetry and literary history and criticism, apart from children’s books, plays, and librettos, all in Filipino. Named National Artist for Literature in 2003, he is currently the Chairman of Komisyon sa Wikang Filipino, and formerly the Dean of the College of Arts and Letters at the University of the Philippines, Diliman. His recent books include Jacintina (2011) and Ang Pag-ibig sa Bayan ni Andres Bonifacio (2012), both published by the UST Publishing House. For RSVP, or for other inquiries and orders, please call (02) 731-3522 or (02) 406-1611 local 8252 / 8278. You may also log on to Facebook.